The Tangy Life: say hello to the new year! Happy happy New Year!! Its that time again, time to make some serious changes! We get a clean slate for 2013 and I'm excited!! But what's something that usually holds us back?! Making Excuses!!! And usually there is an underlying fear, like being afraid of change, or what your friends and family think of you. 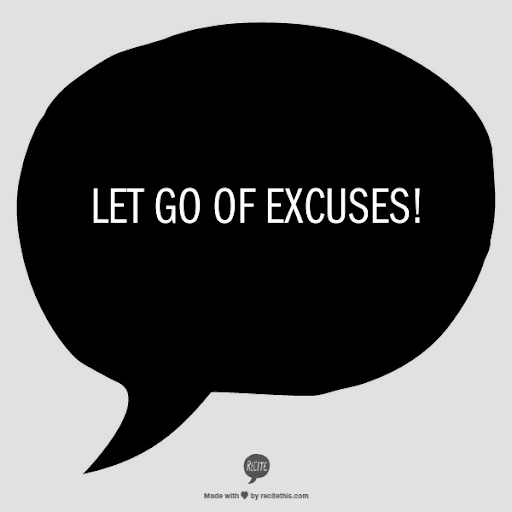 So I'm pulling out some mad inspiration from my favorite bloggers to stop the excuses! And get going on making 2013 the best year evar! You may or may not know, but I love love Gala Darling, she has been an inspirational read to me for a really long time. And I just love her article reflecting on her 6 years of blogging! She is fantastic, and she says it soo perfectly: "When we make excuses, we take a sledgehammer to the knees of our dreams." Though that may sound super dramatic, I really love what she's saying! If you never try, your going to end up regretting it. I get it, fear of failure, fear of not being enough, fear of change, is stopping you. But living fearlessly means having your fears and going through them anyways. Its safer and easier to make excuses, its not that you don't know what you need to do. You already know what you need to do, its just the doing part that's tricky. Leo Babuta, the king of no excuses, really makes it obvious in his "Do Plan": "Reading isn’t doing (unless what you want to do is read more books). Talking isn’t doing (unless you’re learning to communicate better or become a public speaker).Doing is doing." Learning from these two successful bloggers, I know that you just have to do it. Things don't need to be perfect to start them. You don't need to start them just because its the new year. Your doing them, because you want to change, you want to feel better, and you want your situation to get better. 2. Recognize the fears that are holding you back. Write them down, acknowledge them, know them. Make them your best friends. Without them, your going to continue making excuses. 3. Tackle them one step at a time. If you want to do something start small. For me, exercise is not an easy thing for me. So I'm starting with the Herbalife 24 FIT Dvd program, that tells me what workout I need to do on what day, and when I rest, and also helps me start small with only 30 minutes of exercise. Easy Peesy! 4. Stop thinking and just do it!! I tend to over think things, and worry about the outcome of the situation. If it tends to lead to failure, I tend to stray away from it. Most times, your just assuming and you don't really know the outcome, so just let that go, and do it anyways!! This blog is the perfect example of not making anymore excuses, I had been planning this blog,, way in the summer of 2012, and actually kept it a secret for a really long time, because I was soo scared of failing at a new thing again. But I feel as if, I'm freer because I decided to just shut my brain off and just let it happen! And I'm happy I did, because I have never felt happier and more filled with purpose than I do now! So what do you think? Doesn't Gala Darling, and Leo Babuta make you wanna kick all your excuses out the door? Thanks for sharing, I love this quote "Reading isn’t doing (unless what you want to do is read more books). Talking isn’t doing (unless you’re learning to communicate better or become a public speaker).Doing is doing." This is what I have to work on for 2013! I hope you have a happy, healthy, and successful New Year.